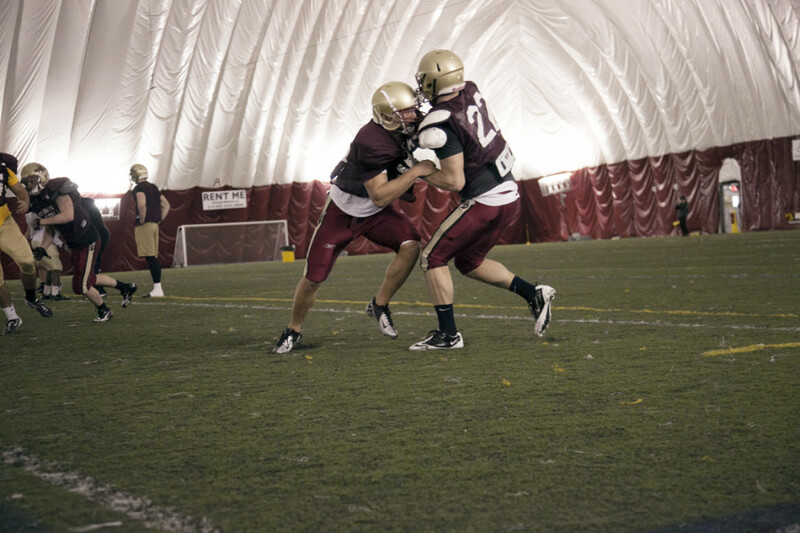 The Concordia Stingers football team began the process of turning the page on their tumultuous 2012 season as they opened their annual spring camp practice last Thursday at the Stinger dome. The Stingers have seen their fair share of adversity over the past year. For starters, they finished last season in last place with a 1-8 record after having to forfeit two games they’d won due to playing with an ineligible player on their roster. They’ve also lost their receiving coach Dave Spence, who left the team to take on the same position with the McGill Redmen. “They’re paying him four times what I was able to pay him, and they’ve offered him a full-time position for next year, which I don’t have the financial ability to do,” explained Stingers head coach Gerry McGrath. Also gone from next year’s coaching staff is defensive coordinator Phil Roberts, who is leaving for personal reasons. “Phil is a good friend of mine. He drives every day from Ottawa to coach, and he’s been doing it for three years,” said McGrath. Roberts’ departure opens the door for the Stingers’ 2012 linebacking coach Luc Pelland to take his old spot, however. “That’s not so much a coaching loss, just a situation that’s better for everybody,” said McGrath. If the coaching switch-ups weren’t enough, the past year has seen numerous players leave the Stingers program. Starting defensive end Louis Taillon and defensive back recruit Danny Tam left the team to join the powerhouse Laval Rouge et Or last August, while starting defensive back Kadeem Vaillancourt did the same earlier this year—joining a long list of players and coaches who have defected since the 2011 season. “Some kids aren’t happy with their fate in a certain program and they can leave. It’s better they leave than be malcontent in the program they’re in,” said McGrath. “If they want to go and play somewhere else, then we don’t want them here,” added Quest. Despite their issues last year, McGrath says last season’s record wasn’t reflective of the team’s progress. Last season marked just the third time the Stingers missed the playoffs since McGrath took over as head coach in 2000. However, two out of those three playoff absences have come within the past three seasons. That being said, McGrath isn’t concerned about his job should the Stingers miss the playoffs next season. One thing the Stingers can look forward to in the season to come is a recruiting class that so far features three CEGEP players—two Division 1 offensive linemen and one Division 3 all-star defensive back—and five players from Ontario. “Anytime you get a blue-chip player, he makes your team better, so we expect them to come in and play at a competitive level right away,” said McGrath of the incoming talent. Leading the Ontario pack is Clark Green, a punter from Chatham-Kent Secondary School. In 2011, he was a member of Team Ontario West at the under-18 Football Canada Cup and was selected to be a member of the All Canada Gridiron all-star game, which features recruits from competing high schools, in 2011 and 2012. “Having another guy to come and kick with me is always awesome,” said Treloar. The Stingers will also get some help on defence with the addition of defensive ends Rivver Griffith, from the Mississauga Warriors of the Ontario Varsity Football League, and Jonathan Langma, a transfer student from St. Francis Xavier University, along with safety Shaquille Davis from Richmond Hill, ON. They’ll even have help on the scrimmage line with the addition of Jordan Oliver, a lineman from Scarborough, ON, who last played for Sir Wilfrid Laurier Secondary School of London, ON. “The CIS is a different game; it’s bigger, stronger guys. Hopefully they’ll come in and compete right away and push for a starting spot,” said Quest. Former CÉGEP de la Pocatière defensive back Nicolas Picard, along with offensive linemen Cédric Vinet and Sacha Jacimovic, from Champlain-Lennoxville and CÉGEP du Vieux-Montréal, respectively, are also set to join the team. The Stingers will get 10 practices within the next couple of weeks before welcoming their new recruits at training camp in August. They open their season on Aug. 31, when they’ll welcome the Université de Montréal Carabins to Concordia Stadium.